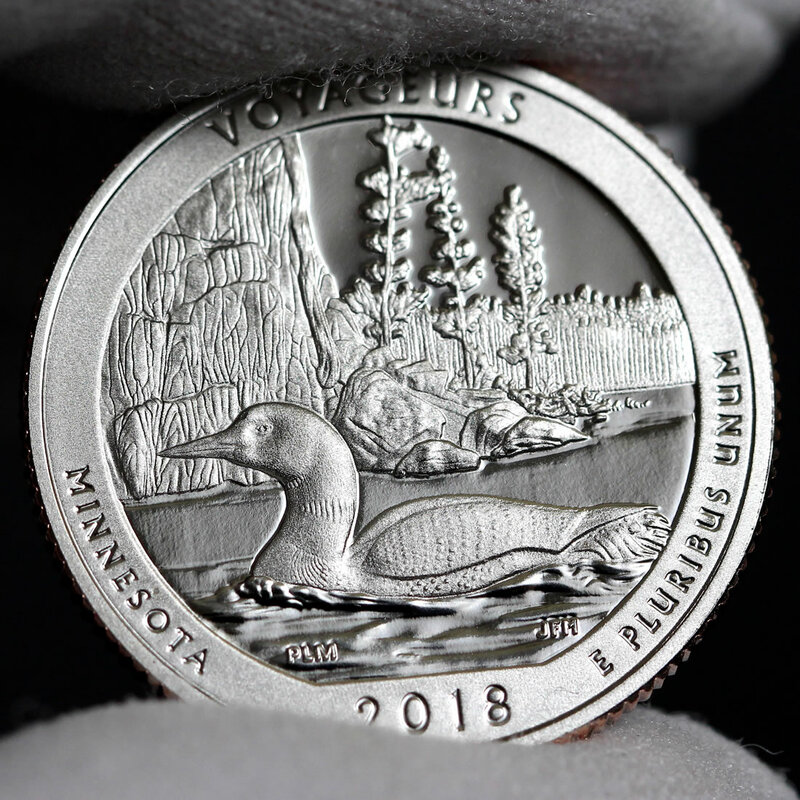 Large 3-inch, 5-ounce .999 fine silver coins honoring Voyageurs National Park of Minnesota will go on sale today, June 14. The United States Mint will release the collectible at noon ET for $154.95. 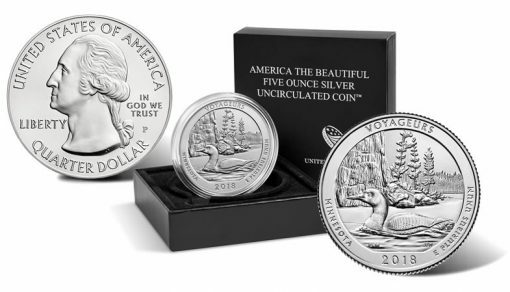 Uncirculated 2018-P Voyageurs National Park Silver Coins arrive encapsulated, set inside a protective outer box and include a U.S. Mint Certificate of Authenticity. 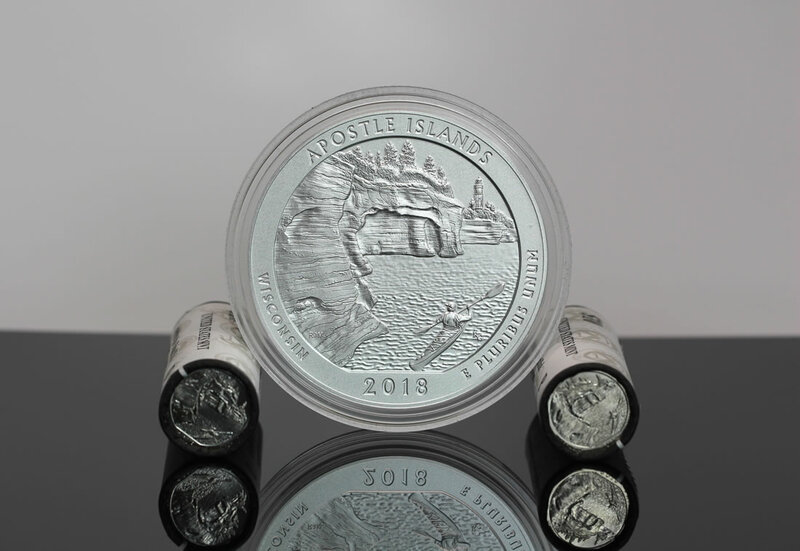 This coin is produced with a vapor blast uncirculated finish at the U.S. Mint facility in Philadelphia, and is issued as a part of the agency’s America the Beautiful Five Ounce Silver Uncirculated Coin™ Program. This CoinNews photo shows a proof Voyageurs National Park quarter. The larger Voyageurs 5-ounce coin features the same design, but in a vapor blast uncirculated finish. 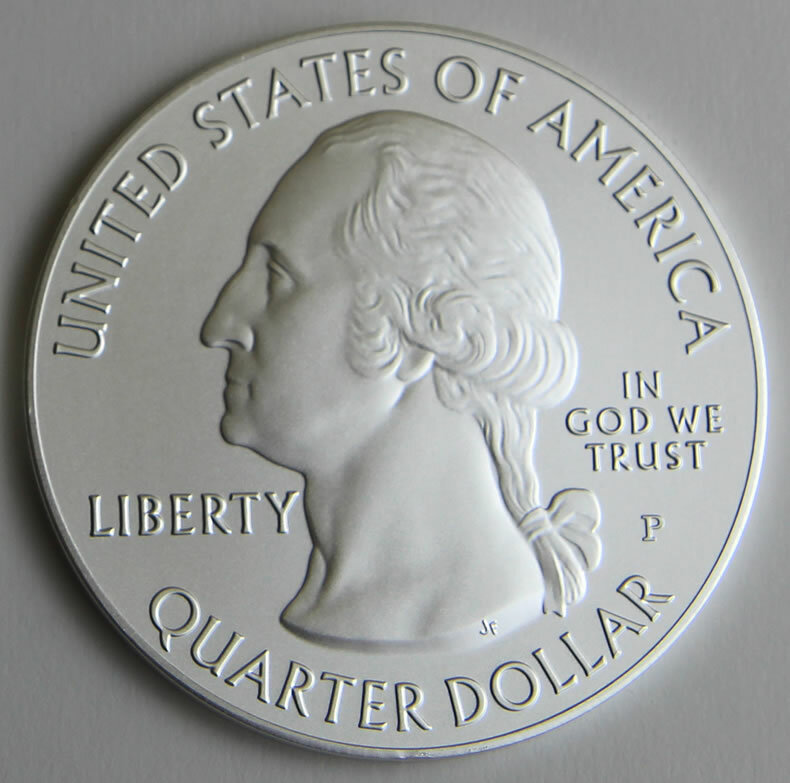 It also has a flat or smooth edge compared to the reeded edge found on quarters. Inscribed near the rim of the coins are VOYAGEURS, MINNESOTA, 2018 and E PLURIBUS UNUM. Artist and sculptor initials are also near the bottom (on the left and right sides). Appearing on the coin’s reverse (tails side) is a design emblematic of the national park, which is in northern Minnesota near the city of International Falls. It shows a common loon as it swims in the waters of the national park. Behind the loon we can see a rock cliff and some trees on a shoreline. The image is the same basic design as on the recently released Voyageurs National Park quarter. U.S. Mint AIP (Artistic Infusion Program) Designer Patricia Lucas-Morris designed the image. Sculpting was the work of U.S. Mint Sculptor-Engraver Joseph Menna. 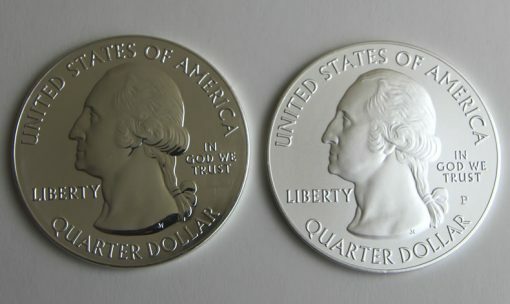 Issued as a companion series to the U.S. Mint’s America the Beautiful Quarters® Program, the obverse (heads side) bears the effigy of George Washington, the first President of the United States. The portrait was designed by artist John Flanagan and has been seen on quarters since 1932. This CoinNews photo shows the obverse or heads side of an America the Beautiful Five Ounce Silver Uncirculated Coin. The design is common across the series, and on companion quarters. Shared inscriptions include: UNITED STATES OF AMERICA, IN GOD WE TRUST, LIBERTY and QUARTER DOLLAR. A mintmark of ‘P’ on the obverse indicates the production facility of the Philadelphia Mint. An edge inscription on each release includes the coin’s specifications, stating: "999 FINE SILVER 5.0 OUNCE." Voyageurs National Park Five Ounce Silver Uncirculated Coins may be purchased directly from the U.S. Mint via its online page for silver coins. Orders are also accepted by calling 1-800-USA-MINT (872-6468). Mintage limit for the collector coin is 20,000 with no household or product limits in place. Similar bullion coins are also produced by the U.S. Mint featuring nearly identical specifications. This includes the designs, the composition of 5 ounces of 99.9% pure silver and the diameter of 3 inches. Where the bullion coins differ, however, is in their finish, the mintmark, and their distribution. A CoinNews photo of obverse sides of two America the Beautiful Five Ounce Silver Coins. A bullion version is left and a collector uncirculated edition is right. The bullion coin has no mintmark. The collectible coin has a ‘P’ mintmark. They also have different finishes. The bullion coins have a shinier brilliant finish owing to the fact that they are not vapor blasted like their uncirculated counterparts. In addition, they do not have a ‘P’ mintmark despite also being produced at the Philadelphia Mint. Finally, bullion coins are sold through the Mint’s network of authorized purchasers at small premiums above the current melt value of each coin. This differs from the uncirculated coins which are sold to the public directly from the U.S. Mint at a fixed, but typically higher price. How many of 2018 5 ounce this coin were actually minted?